Georgetown University's Qatar campus is set to host Sami Al-Arian for a lecture tonight in Doha. According to a news release from the school's Middle Eastern Studies Student Association, Al-Arian is a "civil rights activist" who hopes to challenge students to "make it a better, and more equitable and peaceful world." Those are charitable descriptions for Al-Arian, a documented member of the Palestinian Islamic Jihad's Majlis Shura, or board of directors. According to the Islamic Jihad's bylaws, which law enforcement agents found during searches of Al-Arian's home and offices, there can be "No Peace without Islam." The group's objective is to create "a state of terror, instability and panic in the souls of Zionists and especially the groups of settlers, and force them to leave their houses." It's an agenda Al-Arian took to heart. Following a double suicide bombing in 1995 that killed 19 Israelis, Al-Arian solicited money from a Kuwaiti legislator. "The latest operation, carried out by the two mujahideen who were martyred for the sake of God, is the best guide and witness to what they believing few can do in the face of Arab and Islamic collapse at the heels of the Zionist enemy..." he wrote. "I call upon you to try to extend true support of the jihad effort in Palestine so that operations such as these can continue, so that the people do not lose faith in Islam and its representatives..." he wrote. Four years earlier, he spoke at a fundraiser in Cleveland, introduced as the head of the "active arm of the Islamic Jihad Movement in Palestine." Why, then, is a Jesuit university, albeit at a campus in Qatar, hosting a leader of a designated terrorist group's "active arm"? There's a family bond between Georgetown University and the Al-Arians. Son Abdullah is an assistant professor at Georgetown's Qatar campus, teaching history in its School of Foreign Service. He earned his Ph.D. at Georgetown, writing his dissertation about the Egyptian Muslim Brotherhood during the 1970s, a time his father acknowledges being part of the global Islamist movement. Jonathan Brown, Al-Arian's son-in-law, also works at Georgetown, as the [Saudi] Prince Alwaleed Bin Talal Chair of Islamic Civilization. Brown recently drew criticism for a lecture in which he argued that slavery isn't inherently "morally evil" if the slave is treated well. He also minimized sexual consent as a recent social more, arguing no one is really free enough to grant consent anyway. Property records show Brown and his wife Laila Al-Arian bought a modest house just outside Tampa in 2015. Brown also owns a $1.1 million house in Mclean, Va.
Brown's boss, Georgetown University Professor John Esposito, has been a staunch Al-Arian defender. Al-Arian is "an extraordinarily bright, articulate scholar and intellectual-activist, a man of conscience with a strong commitment to peace and social justice," Esposito wrote in a letter to a federal judge. Brown's slavery and sexual consent lecture was hosted by the International Institute of Islamic Thought (IIIT) in Herndon, Va. The IIIT was a prime financial supporter of a think tank Al-Arian founded in Tampa called the World and Islam Studies Enterprise (WISE). It provided cover for at least three other members of the Palestinian Islamic Jihad's Shura Council, including his brother-in-law Mazen Al-Najjar, an academic named Basheer Nafi and Ramadan Abdullah Shallah – the Islamic Jihad's secretary general since late 1995. Federal prosecutors wanted Al-Arian to tell a grand jury what he knew about the IIIT's financial support for terrorists. He refused. Al-Arian was charged with criminal contempt after maintaining that stance even after a judge granted him immunity for his truthful testimony. The case never went to trial. Al-Arian was deported to Turkey in 2015, pursuant to terms in his 2006 guilty plea connected to his Palestinian Islamic Jihad support. He now works as "director of the Center for Regional Politics at Istanbul Sabahattin Zaim University," the Georgetown Middle East students group's news release said. Al-Arian is a computer scientist. Sabahattin Zaim opened in 2010 and claims to have about 1,100 undergraduate students. 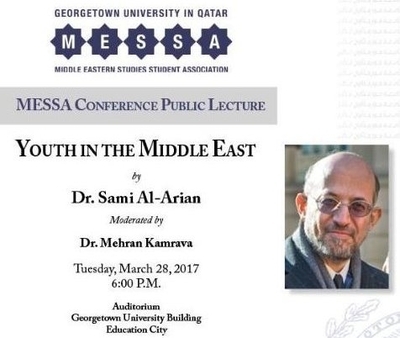 While the Georgetown University program is organized by a student group, promotional material lists Mehran Kamrava as moderator. Kamrava directs the Georgetown School of Foreign Service's Center for International and Regional Studies. His presence adds the university's imprimatur to the Al-Arian event. In addition, the School of Foreign Service posted the news release promoting Al-Arian's lecture. Qatar has supported Hamas, the Islamic Jihad's rival Palestinian terrorist group, providing money and refuge for Hamas leaders. In that light, Al-Arian's invitation doesn't seem out of place. But it is still an event hosted by a Georgetown University campus, moderated by one of its prominent faculty. While Al-Arian has tried to deny his Islamic Jihad activities, or at least minimize them, his work to advance the group's bloody ambitions is undeniable. He self-identified as the Shura Council's secretary. In his plea agreement, he admits lying about Shallah's prominent role in the Islamic Jihad. During his 1991 remarks in Cleveland after his "active arm" introduction, Al-Arian urged donations for jihad. "Your brothers in Palestine are struggling with their beings," he said, "so let us struggle here with our money." "This is the way of giving," he said earlier. "This is the way of struggle. This is the way of battle. This is the way of jihad. This is the way of martyrdom. Thus is the way of blood, because this is the path to heaven." The student association's news release failed to mention this background as a convicted felon, describing the former University of South Florida professor as a "civil rights advocate." It fails to mention Al-Arian's guilty plea, and whitewashes his resulting deportation to Turkey by saying "Al-Arian relocated." The federal judge who saw all the evidence against Al-Arian, who watched him lie about his true identity and violent ambitions, called him a "master manipulator." Old habits die hard, apparently. The question in this case is whether Georgetown and its student groups are being duped or are witting accomplices in whitewashing a terrorist into a "human rights advocate."